Despite robust gross domestic product (GDP) growth this year, our Recession Probability Model and Recession Dashboard on pages 8 and 9 still suggest a recession is likely to begin in early 2020. While there is little risk of downturn in the near term, more restrictive monetary policy will overtake an overheating economy. We examine why, despite prevailing sentiment to the contrary, the flattening yield curve remains a powerful indicator of coming recession. Using the yield curve as a recession signal is not something we invented— its predictive ability has been known and extensively studied for decades. Despite its strong track record, however, the signal from the recent flattening of the yield curve has been dismissed by many in the market, and by many policymakers at the Fed. The most prominent argument made for why the signal from the yield curve is not valid this time around is that QE programs from both the Fed and foreign central banks have held down long-term interest rates and caused the yield curve to be unduly flat. As supporting evidence, the naysayers point to econometric model estimates showing that term premiums—the excess return investors can expect to earn from buying a longer maturity, fixed-rate bond instead of rolling a sequence of short-term positions over the same horizon— are not only lower than in past cycles, but are in fact negative (see chart). We see several flaws in these arguments. Source: Federal Reserve Bank of New York, Guggenheim Investments. Quarterly average data as of 9.30.2018. Shaded areas represent periods of recession. Term premiums are not as low as the Fed’s models say: Because term premiums cannot be observed, investors must rely on model estimates to gauge the duration risk premiums embedded in Treasury securities. One of the most frequently cited is the Adrian, Crump, and Moench (ACM) model, which is published by the Federal Reserve Bank of New York (New York Fed). In the New York Fed’s models, term premium is defined as the observed level of 10-year Treasury yields minus the estimate of the “risk-neutral yield,” which is an estimate of the average short-term rate expected to prevail over 10 years. The ACM model currently indicates that 10-year term premiums are -35 basis points, roughly 85 basis points below where they were in mid-2005, one year before the end of the last Fed tightening cycle. This would seem to corroborate research suggesting that the Fed’s asset purchase programs cumulatively depressed 10-year term premiums by over 100 basis points (this effect would have faded somewhat in recent years). The problem is that today the ACM model overstates expected short-term rates, falsely implying that term premiums are lower than they really are. Specifically, ACM indicates that the risk-neutral 10-year yield is currently 3.50 percent, considerably above our own forecasts of the average short-term rate that will prevail over the next decade. Other outside estimates support this view: the 10-year overnight index swap (OIS) rate, or the average fed funds rate priced in to a fixed-floating swap, is 2.90 percent. Meanwhile, the median estimates from the New York Fed’s August 2018 dealer and buy-side policy surveys are both 2.50 percent. 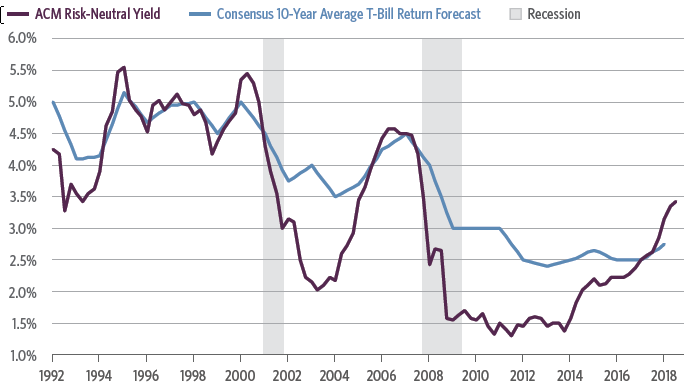 Similarly, respondents to the Federal Reserve Bank of Philadelphia’s Survey of Professional Forecasters expect the average three-month Treasury bill return over the next 10 years to be 2.75 percent. Each of these independent forecasts suggests the ACM risk-neutral yield estimate is too high. This leads us to believe that the New York Fed’s model understates term premiums, which undercuts a key pillar supporting the argument that QE has depressed term premiums and made the yield curve unduly flat relative to past cycles. QE may have flattened the curve, but net Treasury issuance has steepened it: We would not argue with the conclusion that the Fed’s asset purchases put downward pressure on term premiums by removing duration risk the market would have otherwise had to bear. The mistake that some observers make, however, is to reason that because QE depressed term premiums, and because QE operated on the curve in this cycle but not in previous cycles, then the yield curve must be unduly flat in this cycle. In reality, forces other than monetary policy also operate on term premiums and the shape of the curve, and these forces change from cycle to cycle. The most important of these factors is the net duration supply issued by the Treasury Department, which is a function of the deficit financing needs of the U.S. government as well as the debt management policy decisions of the Treasury. Since the crisis the Treasury has extended the weighted average maturity of the outstanding stock of debt by issuing a larger proportion of long-term debt. At the same time the United States has run significantly larger deficits than in past cycles, requiring a much larger dollar amount of net Treasury issuance. The net effect of these two factors has been to substantially increase the amount of duration risk held by Treasury market investors (excluding the Fed and other U.S. government accounts). The decline in Treasury yields relative to the pre-crisis period further extended the stock of privately held Treasury duration risk, since lower-yielding bonds carry greater duration risk than higher-yielding bonds of the same maturity. Many in the market, as well as policymakers at the Federal Reserve (Fed), have argued that the shape of the yield curve can no longer be trusted as a recession predictor given the distortions caused by quantitative easing (QE) programs in the United States and abroad. Below are some excerpts from historical Fed communications during periods of a flat yield curve. While the specifics are always different, the dismissal is always the same. Just like in past cycles, we believe discounting this signal could lead to an over-tightening of monetary policy that brings about the next recession. 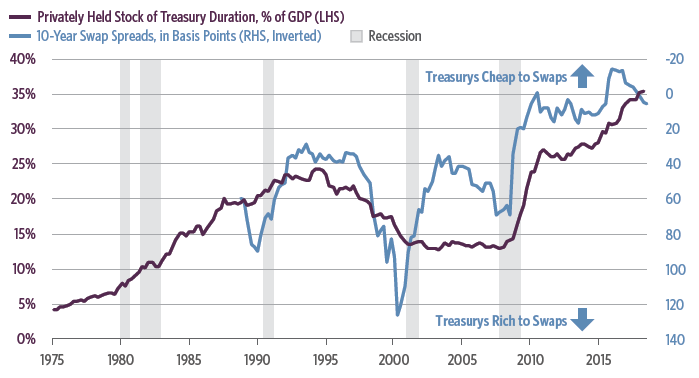 We combine these factors to estimate the total amount of Treasury duration risk held by the public, converting that total into 10-year Treasury duration risk equivalents and expressing this quantum as a percent of GDP over time. The increase in Treasury duration risk has played a role in an increase in Treasury yields relative to swap rates (see chart, next page). If there were ever a time when an argument could be made that supply/demand factors were causing the yield curve to be unduly flat, it was during the late 1990s. During that period the ratio of duration/GDP fell markedly as a result of the federal budget surplus. This coincided with a sharp widening of 10-year swap spreads, or the spread of the fixed leg of a 10-year Libor-based interest rate swap over the yield on the current 10-year Treasury note. Although 10-year Treasury yields were roughly unchanged from mid-1997 to mid-2000, Treasurys richened considerably versus swaps due to their relative scarcity. This caused the Treasury curve to be flatter than it would have otherwise been. Source: Haver Analytics, U.S. Treasury, Guggenheim Investments. Data as of 3.31.2018. Note: Excludes Federal Reserve and other U.S. government holdings. Shaded areas represent periods of recession. The experience of the last decade offers an interesting contrast. The total amount of Treasury duration risk held by the public increased dramatically between late 2008 and mid-2011 as interest rates fell, the deficit ballooned, and the Treasury department began to extend the average maturity of its debt portfolio. The rise in duration/GDP, which occurred despite the Fed’s first QE program, coincided with a sharp narrowing of 10-year swap spreads. While absolute yields fell, long-term Treasurys cheapened notably versus swaps, causing the Treasury curve to be steeper than it would have otherwise been. Since the third round of QE ended in late-2014, growth in duration/GDP has continued at a much more rapid pace than in the last two business cycles, which ironically exerted steepening pressure on the curve. Post-crisis regulatory changes and foreign exchange reserve intervention have contributed to a steeper curve. Two important post-crisis regulatory changes have affected the shape of the Treasury curve. First is the Securities and Exchange Commission’s reform of money market funds, which took effect in October 2016, and second is the Enhanced Supplementary Leverage Ratio (ESLR) for large banks, which was first proposed in 2013 and with which banks moved to comply over the subsequent three years. Money fund reform has had the effect of increasing demand for T-bills, which caused their yields to fall relative to OIS. For its part, the ESLR caused large broker-dealers to reduce their Treasury and repo market-making activities in a way that caused long-dated Treasury yields to rise relative to OIS. This cheapening was particularly acute after August 2015, when China devalued the yuan and some emerging market central banks began to sell substantial amounts of Treasurys to support their currencies. With bank and dealer balance sheets constrained by the leverage ratio, large sales of Treasurys by foreign central banks in the secondary market resulted in substantial relative value dislocations. Together, these factors caused the three-month/10-year Treasury curve to steepen by 60 basis points between the third quarter of 2014 and the third quarter of 2016. While a more bank-friendly regulatory agenda and higher T-bill supply since the 2016 election have tempered some of these impacts, the three-month/10-year Treasury curve remains 30 basis points steeper than the OIS curve (see chart below). In short, those that argue this time is different because QE has flattened the curve must also acknowledge that higher net Treasury supply and regulatory changes have worked to steepen it. Source: Bloomberg, Guggenheim Investments. Data as of 9.24.2018. Note: Five-day moving average. Another way to think about the yield curve is what it signals about market beliefs regarding future economic activity. 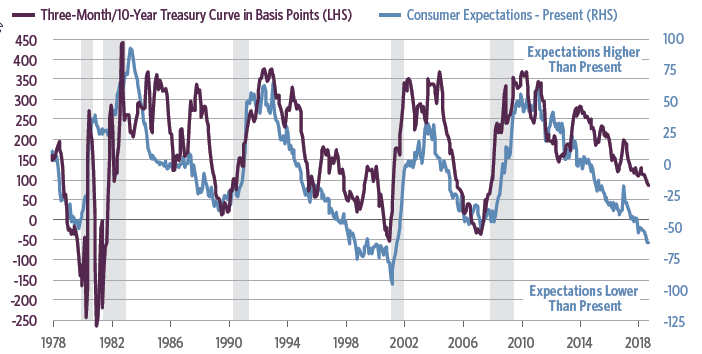 A variety of survey data, covering both consumers and businesses, show that periods of a flat or inverted yield curve tend to coincide with low expectations for the future relative to the present. In other words, these are periods in which respondents think current conditions are as good as it gets. The chart below shows the difference between consumers’ confidence now and what they expect in six months. As each cycle ages, consumers increasingly view the present more favorably than the future. This implied expectation of a slowdown coincides with a flattening yield curve as the market prices in peaking economic conditions. Source: Bloomberg, Haver Analytics, Guggenheim Investments. Data as of 8.31.2018. Shaded areas represent periods of recession. To test if the yield curve is reflecting expectations accurately, we ran a regression of the three-month/10-year curve against four of these survey measures from 1978–2012 (see chart below). The green line in the chart below shows the predicted curve over the past five years, revealing that the slope of the curve has been right about where expectations surveys suggest it should have been. This implied curve flattening from survey data is additional evidence that the yield curve’s signal regarding our position in the cycle is not distorted. In other words, investors ignore the yield curve at their peril. Source: Bloomberg, Haver Analytics, Guggenheim Investments. Data as of 8.31.2018. *Surveys include Conference Board expectations minus current conditions, Federal Reserve Bank of Philadelphia manufacturing future activity minus current activity, National Federation of Independent Businesses plans to add to inventories minus currently increasing inventories, and University of Michigan buying conditions for housing due to interest rates. Shaded areas represent periods of recession. Our view that the next recession will begin in early 2020 remains intact in the latest update of our Recession Dashboard and Recession Probability Model. Despite the robust third-quarter GDP print, the Recession Probability Model below ticked down in the third quarter, with near-term risks subdued. The Dashboard on the next page shows a continued overheating of the labor market, and in turn a less accommodative monetary policy stance. Because of this gradual policy tightening, the flattening trend in the yield curve remains right on track with the average of previous cycles 18 months before a recession, while economic activity, as measured by the Leading Economic Index (LEI), hours worked, and retail sales, remains robust, signaling little chance of a downturn beginning in the next few quarters as the economy continues to overheat. Hypothetical Illustration. The Recession Probability Model is a new model with no prior history of forecasting recessions. Actual results may vary significantly from the results shown. Source: Haver Analytics, Bloomberg, Guggenheim Investments. Data as of 9.30.2018. 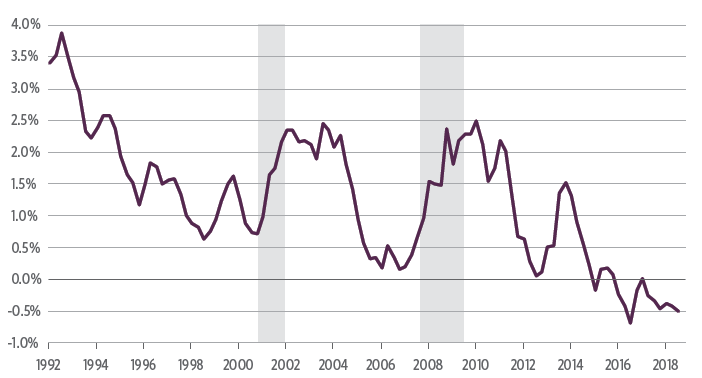 Shaded areas represent periods of recession. 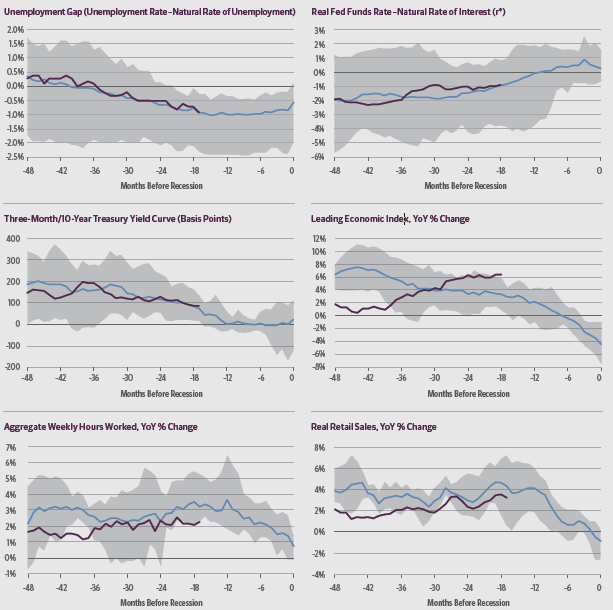 The six indicators in our Recession Dashboard have exhibited consistent cyclical behavior that can be tracked relatively well in real time. We compare these indicators during the last five cycles that are similar in length to the current one, overlaying the current cycle. Taken together, they suggest that the expansion still has room to run for approximately 18 more months. Source all charts: Haver Analytics, Bloomberg, Guggenheim Investments. Data as of 9.30.2018. Real fed funds and LEI as of 8.30.18. Includes cycles ending in 1970, 1980, 1990, 2001, and 2007. Past performance does not guarantee future results. One basis point is equal to 0.01 percent. 2. Guggenheim Partners assets under management are as of 9.30.2018 and include consulting services for clients whose assets are valued at approximately $66bn. ©2018, Guggenheim Partners, LLC. No part of this document may be reproduced in any form, or referred to in any other publication, without express written permission of Guggenheim Partners, LLC. Guggenheim’s fixed-income portfolios are managed by a systematic, disciplined investment process designed to mitigate behavioral biases and lead to better decision-making. Our investment process is structured to allow our best research and ideas across specialized teams to be brought together and expressed in actively managed portfolios. 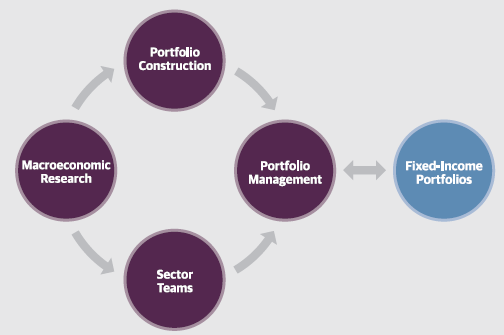 We disaggregated fixed-income investment management into four primary and independent functions—Macroeconomic Research, Sector Teams, Portfolio Construction, and Portfolio Management—that work together to deliver a predictable, scalable, and repeatable process. Our pursuit of compelling risk-adjusted return opportunities typically results in asset allocations that differ significantly from broadly followed benchmarks. Guggenheim Partners is a global investment and advisory firm with more than $265 billion2 in assets under management. Across our three primary businesses of investment management, investment banking, and insurance services, we have a track record of delivering results through innovative solutions. With 2,400+ professionals based in more than 25 offices in six countries, our commitment is to advance the strategic interests of our clients and to deliver long-term results with excellence and integrity. We invite you to learn more about our expertise and values by visiting GuggenheimPartners.com and following us on Twitter at twitter.com/guggenheimptnrs. For more information, visit GuggenheimInvestments.com.